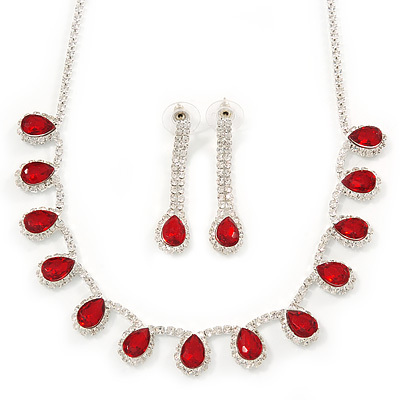 Add a chic touch to any outfit with this Bridal/ Wedding/ Prom Siam Red/ Clear Austrian Crystal Necklace And Drop Earrings Set In Silver Tone. The necklace made of 13 teardrop shaped crystal beads attached to a silver plated clear crystal chain. Each drop accented with a pear-cut Siam red stone and encircled with a border of clear crystals. The necklace has a 36cm length with an additional 11cm extender. It's fastens with a lobster-claw clasp for a comfy fit. The coordinating long drop earrings have comfy post backings. They have about 45mmL. Each earring weight is about 2g.